Full Peruvian - Snowmass Silken Gold is just that...Suri fleece as fine as Silk and the value of Gold. Weather'd T Ranch purchased Snowmass Silken Gold in 2005 from the North American Stud Program. He is truly a magnificent male and to date has produced progeny worthy to represent future generations. 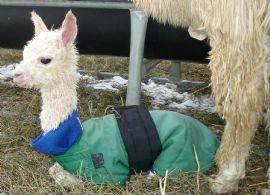 We are thrilled to add Snowmass Silken Gold to our breeding program. Surpassing our expectations with his progeny, the cria in 2006 are exhibiting luster, consistent lock and correct conformation. 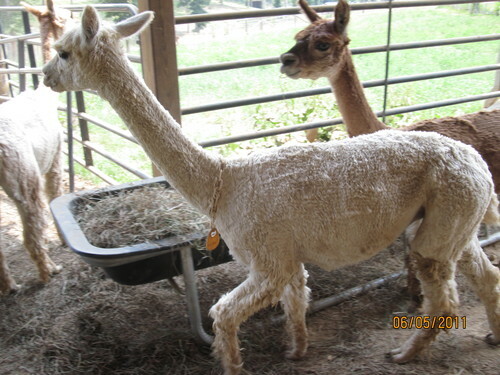 Reserve your breeding today....call for additional information, fiber sample and photos. Chandelle is a beautiful young female whom we purchased from alpaca Jacks Suri Farm. Chandelle has been a very consistant producer. All of her babies have been quality, and so have her grandbabies. Victoria holds a tie for the 2nd highest female score on our farm. Her son Victor holds the 3rd highest male score on our farm. Congrats Vicki!!! We are offering Vicki for sale as we need cash at the moment. Don't pass up the opportunity to own one of our best females!! !